Professor Malcolm Levitt has been awarded an ERC Advanced Grant for the second time in 10 years. Five researchers from the University of Southampton have won prestigious and competitive European research grants, totalling more than €12 million. The funding awards mark the biggest success the University has had in winning the European Research Council’s (ERC) Advanced Grants. It is also the second time that two of the researchers, Professor Malcolm Levitt and Professor Lajos Hanzo, have won ERC Advanced Grants - a superb achievement given that only 29 other UK researchers have accomplished this in the last 10 years. Professor Lajos Hanzo, from Electronics and Computer Science, successfully bid for €2.49 million for his QuantCom research project, which aims to solve part of the ‘quantum jigsaw puzzle’ and contribute to the conception of the wireless Quantum Internet, or Qinternet, conceived for seamless high-speed connectivity across the globe at uncompromised security. 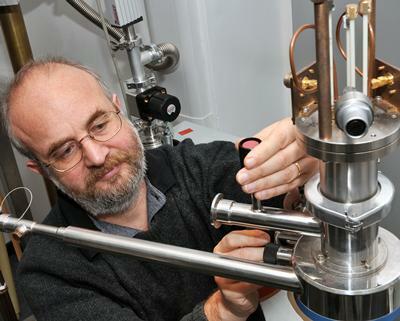 Professor Peter Kazansky, from the Optoelectronics Research Centre, has been awarded €2.5 million for his project entitled ENIGMA (ENgIneerinG MAterial properties with advanced laser direct writing). The project will examine the interaction between intense ultra-short light pulses and matter at, or below, the wavelength scale, reaching states of matter found only deep in the cores of the Earth and other planets. Professor Malcolm Levitt, from the School of Chemistry, has won a grant of €2.76 million for his FunMagResBeacons (Functionalised Magnetic Resonance Beacons for Enhanced Spectroscopy and Imaging) project, which will aim to develop agents that may be used together with magnetic resonance (MRI) and other forms of spectroscopy to map out specific chemical and physical conditions deep inside an object, ultimately leading to potential applications such as cancer detection and diagnosis. Professor Nikolay Zheludev, also from the Optoelectronics Research Centre, has been awarded €2.57 million for his FLEET (FLying ElectromagnEtic Toroids) project, which will study the generation, detection and interaction with matter of Flying Toroids, a type of light pulses never experimentally studied before. Professor Tony Brown, from the School of Geography and Environment, has been awarded €2.66 million for a project entitled TerrACE, looking into the long-term creation, maintenance and use of ancient agricultural terraces. Professor Mark Spearing, University Vice-President (Research and Enterprise), added: “This is a fantastic achievement for the five colleagues who have won ERC grants. These are particularly competitive and prestigious grants to win and they also provide unrivalled freedom to develop an area of research according to the individual’s agenda.